We are called as Latter-day Saints to be a force for good in the world in every way possible, which necessarily includes active and positive engagement with political and social issues. 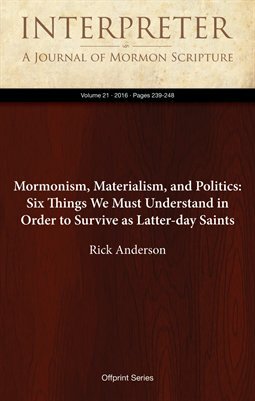 At the same time, it is essential to our spiritual survival that we never allow ourselves to forget the radical difference between the philosophies of men — no matter how superficially harmonious some of these may seem with particular principles of the gospel or with some aspects of traditional Mormon culture — and the teachings of the prophets. In a world that constantly entices us with messages designed to lure us away from the eternal truths of the restored gospel and into the embrace of philosophies that are partially and contingently true at best and actively destructive at worst, we must exercise constant vigilance. This essay suggests and discusses six propositions that, if understood and embraced, should help us maintain that vigilance.